The Ripple (波紋 Hamon), is an energy used in the ancient form of martial arts, Sendō (仙道, lit. "Way of The Hermit/Wizard"). Through self-controlled respiration, a trained person can produce an energy manifesting as ripples throughout their body and that is identical to the energy of the Sun. Hamon is an energy identical to the Sun's rays, which the human body can produce through controlled breathing, having the effect of producing ripples of energy propagating from the bloodstream to the rest of the body and other objects in contact with it. The Ripple manifests itself as electricity-like sparks, and it can be seen by ordinary humans. The Ripple can also affect non-living things. An object charged with Ripple energy will have one or several attributes enhanced by the energy, making it a more effective tool, or weapon. Liquids conduct the Ripple especially well (and the user's Ripple shows on liquids as actual ripples). It is mentioned by practicers of this style that objects covered in oil can conduct Ripple much easier. However while all materials can conduct the Ripple more or less well, inorganic material such as metal cannot store the energy, which simply passes through. At D-Rank, up to 10% of the user's chakra can be dedicated to Hamon Style sub-techniques. At C-Rank, up to 20% of the user's chakra can be dedicated to Hamon Style sub-techniques. At B-Rank, up to 30% of the user's chakra can be dedicated to Hamon Style sub-techniques. At A-Rank, up to 40% of the user's chakra can be dedicated to Hamon Style sub-techniques. At S-Rank, up to 50% of the user's chakra can be dedicated to Hamon Style sub-techniques. Due to its identical nature to the positive energy of the Sun, the Ripple's primary uses are to heal various wounds or ailments, and combat creatures such as zombies or reanimated bodies. Living organisms can be affected by Ripple attacks, but are not automatically hurt by it. For instance, Hamon is transferable between people. Hamon users can reject harmful substances inside of them by ejecting it from their bloodstream with the use of Ripple energy. Producing the Ripple also preserves the user's vitality, making them look more youthful and be more energetic even during old age although this method has limits. To produce an optimized Ripple, users must precisely control the energy produced by the breathing. It typically requires focusing the energy before unleashing it all at once to create a powerful burst of Ripple. Merely producing a light amount of Ripple requires the user to breathe a precise way. Thus to not only enhance the ability to produce it, and efficiently wield it in battle, the Ripple user must undergo training and exercise his or her ability. Ripple users undergo harsh physical training to increase their breathing ability and thus the amount and power of the Ripple they produce. Although the training is explained as being focused on the rhythm of the breathing, which will positively impact on the whole body, it doesn't stop a master from using physical exercise, like prolonged swimming, or forcing a student to stay balanced on the tip of the finger. By imbuing any object with Hamon, a Hamon user can perform several techniques that can combine with the warrior's own tactics, to allow for a very flexible fighting style. Because of its versatile nature, many warriors use different weapons ranging from a scarf, soap bubbles, wine, or clackers. Many of the most powerful techniques are classified as "Overdrives" (波紋疾走オーバードライブ Ōbādoraibu, lit. "Ripple Dash/Sprint"), and are often color named for the medium they're used with (Metal Silver being one to transmit through a sword). An object that is impacted with the force of the Overdrive will carry Ripple energy through it, and will become lethal to the touch. While the Ripple Users can become dangerously powerful and turn the most mundane of objects into lethal weapons, they are not without significant weaknesses. This style of Taijutsu has no cost for upkeep, instead relying on one key factor: Ripple users must be able to constantly breathe. If this breathing is stopped or reduced due to injury or other conditions, their ability to use the Ripple is weakened. Similarly, Ripple energy needs a strong flow of the user's blood to be used with any great strength. Hyōton in particular is a hard counter to Hamon users, as being frozen causes their blood to flow slowly to an eventual stop, making them unable to attack as rapidly or disabling them outright. Additionally, heavy blood loss prevents from using the Ripple. Notably, while Ripple energy is strong enough to smash through rock and brick, it is unable to smash through stronger substances like iron or steel. In accordance with its manner of upkeep, Hamon Style techniques must use Hamon instead of chakra. Range: Close, Variable range depending on how much Hamon SP is spent. Lore/Flavor: Joichi charges a Ripple wave through his arm and releases it into a solid object, such as a wall or partition. Description: The Ripple can travel through and reach anything on the other side, and anything hit by the Ripple is sent flying in a spiral. If the enemy is undead, the Ripple will enter their bloodstream and destroy them from the inside. Imperfect reanimations, such as those from the first stage of Corpse Soil Jutsu, disintegrate completely after three posts. On the other hand, perfect reanimations such as those from the second stage of Corpse Soil Jutsu or the Edo Tensei technique will disintegrate completely after six posts. Drawbacks: Inorganic material such as metal cannot store the energy, which simply passes through. and becomes ineffective. Requires Hamon training, and can only be used by spending SP from your Hamon Pool. For more information on Hamon chakra, see its parent technique, Hamon Style. 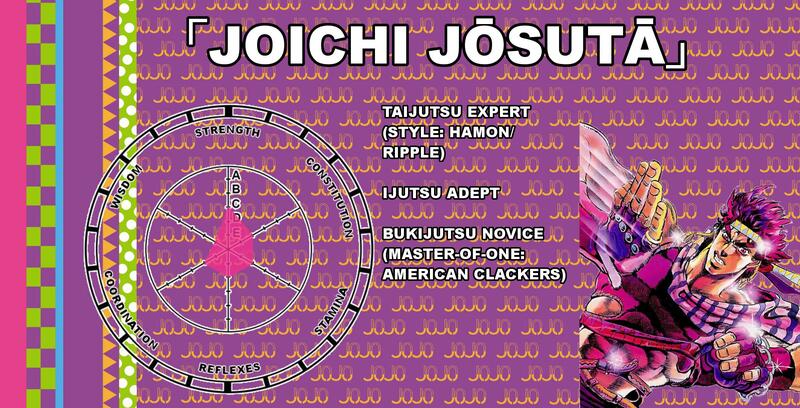 Lore/Flavor: Joichi uses Hamon to dislocate his shoulder and arm to strike opponents at a longer range. Description: In using this technique, Joichi can dislocate his shoulder and arm to strike opponents as if his arm had stretched to twice its size. Drawbacks: This extension of his arm is not permanent, however. Zoom Punch can only be used once per punch. If it misses, it misses, and the user has to spend more SP to extend their arm again. Requires Hamon training, and can only be used by spending SP from your Hamon Pool. 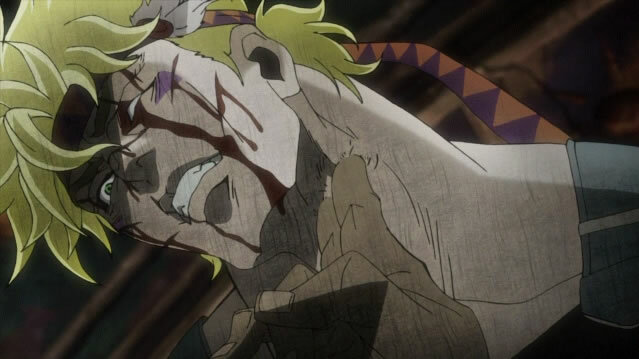 For more information on Hamon chakra, see its parent technique, Hamon Style. Last edited by Joichi Jōsutā on Sun Jan 06, 2019 2:02 am, edited 6 times in total. Hamon Style: Zoom Punch - Sounds too much like the Kemuri-exclusive "Soft Physique Modification" for my liking. Ohhhhh yeah, I forgot that was a thing! Good thing I'm a Kemuri boi. Lore/Flavor: Sunlight Yellow Overdrive is a devastating and extremely rapid flurry of Hamon-infused punches with power comparable to the sun itself, and has the ability to completely obliterate the undead within mere moments. Description: The user must channel Hamon into their fists while controlling their breathing. While it has no elemental affinity, the Ripple's inherent similarities to pure sunlight allow this technique to destroy undead or reanimated foes almost instantaneously. Imperfect reanimations, such as those from the first stage of Corpse Soil Jutsu, disintegrate completely after three posts. On the other hand, perfect reanimations such as those from the second stage of Corpse Soil Jutsu or the Edo Tensei technique will disintegrate completely after six posts. Drawbacks: Requires Hamon training, and can only be used by spending SP from your Hamon Pool. For more information on Hamon chakra, see its parent technique, Hamon Style. Additionally, due to its rapid fire punches coupled with raw strength, this technique requires that the user be at least Masterful in Coordination and Strength. Last edited by Joichi Jōsutā on Sun Jan 06, 2019 2:03 am, edited 2 times in total. Hamon Overdrive - When you say it passes through and hits what's on the other side, do you mean that it hits whatever is touching the other side, or that it goes through a wall and extends out of it? Either way, it should still have a specified range that it can go through. Tsugi ni omae wa, "Approved," to iu! Description: The user must channel Hamon into their fists while controlling their breathing. While it has no elemental affinity, the Ripple's inherent similarities to pure sunlight allow this technique to destroy undead or reanimated foes almost instantaneously. Imperfect reanimations, such as those from the first stage of Corpse Soil Jutsu, disintegrate completely after three posts. On the other hand, perfect reanimations such as those from the second stage of Corpse Soil Jutsu or the Edo Tensei technique will disintegrate completely after ten posts. Description: The Ripple can travel through and reach anything on the other side, and anything hit by the Ripple is sent flying in a spiral. If the enemy is undead, the Ripple will enter their bloodstream and destroy them from the inside. I'm not sure if you answered Keiri's question regarding this technique, but perhaps instead of 'destroy undead from the inside' eh, explain, is it insta kill the moment they get hit? Or over a few posts, etc. "Imperfect reanimations, such as those from the first stage of Corpse Soil Jutsu, disintegrate completely after three posts. On the other hand, perfect reanimations such as those from the second stage of Corpse Soil Jutsu or the Edo Tensei technique will disintegrate completely after ten posts." Sendo Hamon Overdrive has been edited to say this. I still find 10 rounds of post an insane amount but alright, if you ever feel like changing that later, I wouldn’t be opposed. Description: The Ripple can travel through and reach anything on the other side, and anything hit by the Ripple is sent flying in a spiral. If the enemy is undead, the Ripple will enter their bloodstream and destroy them from the inside. Imperfect reanimations, such as those from the first stage of Corpse Soil Jutsu, disintegrate completely after three posts. On the other hand, perfect reanimations such as those from the second stage of Corpse Soil Jutsu or the Edo Tensei technique will disintegrate completely after ten posts. At first I was gonna say six posts, if that also works for you. 'Cause I don't see any Edo Tensei goons not healing within 10 posts. You may edit the technique. Lore/Flavor: Joichi charges a Ripple wave into his knuckles, which then propels outwards in the form of Hamon bubbles. Description: The user fires out a barrage of bubbles from their gloves, each coated in Hamon. This increases the density of the bubbles and allows them to hit objects with a greater impact. When hit by the barrage, anyone under Masterful Strength would be completely blown away. Drawbacks: Despite their increased density, the bubbles still travel through the air like your everyday bubbles. That being, they are impossible to control after traveling very short distances. Requires Suiton. Lore/Flavor: Based on the Ripple Cutter, this technique is a direct improvement on the Bubble Launcher, and creates bubbles with the ability to slice. Description: Unlike the original attack, the bubbles spin at high speed and use centrifugal force, but are able to stay intact due to the Ripple. This causes them to form shapes much like saucers with a small blade-like ring surrounding each bubble. These bubbles move at a higher velocity and have a higher tractability, allowing the user to fire them in any direction with ease. When hit by the barrage, anyone under Epic Strength would be completely blown away. Drawbacks: While this technique's projectiles are faster than those of its parent technique, and can travel much farther, they still cannot be controlled once they set off in a certain direction. Requires Suiton. Lore/Flavor: A more versatile version of Bubble Cutter, the user sacrifices the quantity of the attack, and focuses on effectiveness. Description: By launching a few less bubbles, the user is able to aim them much like homing projectiles. They are able to go around objects and have a higher chance of hitting the opponent. When hit by the barrage, anyone under Legendary Strength would be completely blown away. Drawbacks: Limited to a smaller amount of bubbles than Bubble Cutter. Requires Suiton. Last edited by Joichi Jōsutā on Sat Feb 09, 2019 8:56 pm, edited 1 time in total. First technique shouldn’t be abloe to blow any dude away upon being hit. I recommend adding like a minimum strength requirement to withstand the knockback. Lore/Flavor: Joichi expels Ripple-infused globs of spit from his mouth, turning them into deadly projectiles. Description: The user spits globs of liquid from between his teeth. The Ripple combined with the liquid makes it sharp and dense enough to cut through solid objects, as well as agile and accurate enough to deflect other projectiles of equal or weaker power. Drawbacks: Cannot deflect B-Rank techs or higher. Requires a source of water or other drinkable substance to perform this technique. In a pinch, the user can choose to spend one round of posting to generate saliva in their mouth, in order to alleviate this. Requires Hamon.